"You CAN'T build muscle and lose fat at the same time!" I'm sure you've heard that line many times before from various sources. But it has now been shown that you can build muscle and lose fat at the same time by natural bodybuilder and fat loss expert Tom Venuto. Most of you might begin to think that Tom Venuto is some kind of crackpot - telling you that you can burn fat and build muscle at the same time. However, put aside everything you know, or that you think you know about bodybuilding, fat loss, cardio, and nutrition, and read more about Tom's Holy Grail Body Transformation program. Before I tell you more about his Body Transformation program, I need to tell you a bit more about Tom Venuto. Tom has been working in the bodybuilding, fitness, and weight loss industry since 1989 as a personal trainer, success coach, nutrition consultant, health club manager, publisher and freelance writer. He is also the New York State bodybuilding champion. Tom has written hundreds of articles and has been featured in IRONMAN magazine, Natural Bodybuilding, Muscular Development, Muscle-Zine, Olympian's News (in Italian), Exercise for Men, Men's Fitness, Men's Exercise, Oprah Magazine and The Wall Street Journal. He has published a hardcover book titled "The Body Fat Solution", and Tom's Burn the Fat, Feed the Muscle fat loss program has been one of the best seller on ClickBank.com in the weight loss category since it was first published in 2003, helping hundreds of thousands of people lose weight successfully, keeping it off, and getting in the best shapes. How's that for a track record? Now that you know Tom Venuto is a real bodybuilder and fitness and fat loss expert, you can be sure that he's not just some crackpot or a scam. In fact, I have been working with Tom since 2003 helping him promote his Burn the Fat program. Our site BodybuildingForYou.com has been online since early 2002, and we are very selective about the bodybuilding and fat loss programs that we promote, and I'll stake our reputation on this that Tom Venuto is the real deal. See that photo above? That's Tom at 3.7% body fat - in contest shape. Okay, so how about the Holy Grail total body transformation system? Does it really work? 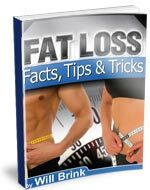 In short, it does, and it effectively proves that you CAN build muscle and lose fat at the same time. These claims of "building muscle and losing fat" are not pulled out of thin air - Tom's total body transformation system comes from research and real life examples from real users just like you. Ben B. is a competitor in Tom's Summer body transformation contest with a starting weight of 153lbs. He finished the 98 day challenge at 154.8lbs - doesn't sound so impressive does it? But with body composition testing, Ben's starting fat was 19.3% and ending body fat was 10.5%, for a 8.8% fat loss (in 98 days)! This translates into 13.2 pounds of fat loss, and a 15 pound gain in lean mass. Jay L., another contestant in Tom's body transformation contest, lost 32.4lbs of fat while gaining 5.4lbs of lean mass in the 98 day contest. Ann G., a 36 year old mother of 3 was also a contestant of Tom's body transformation contest. She lost 16.1lbs of total body weight, gained 4 pounds of muscle, and reduced waist size by 6.6inches in 98 days. Now these are just a few of the many real life examples of users who successfully achieved total body transformation using Tom's methods. Obviously, not everyone will achieve these kinds of results - some will undoubted achieve less, and others possibly more. What is certain, is that Tom Venuto's Holy Grail Total Body Transformation System works. If I didn't believe in Tom's program, and if I didn't own a copy myself, I wouldn't be sitting here typing out this review. 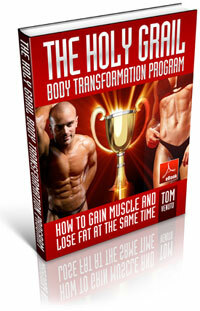 I own both of Tom's programs - Burn the Fat, and Holy Grail Body Transformation. I've read through both cover to cover, and I use them to keep myself (and my wife) in top shape all year long. In part 1 of his Total Body transformation system, Tom thoroughly explains the science and the "how and why" behind gaining muscle and losing fat. You'll quickly discover that his program is a cyclical nutrition plan that makes building muscle and losing fat possible. "The key is to partition as much of that surplus [calories] into lean tissue and have as much of the energy deficit withdrawn from fat tissue as humanly possible. Anabolic and catabolic hormones are primary players in the partitioning of energy and nutrients." In the second part of the program, Tom shows you exactly how to achieve the elusive objectives described in the quote above - here, he takes everything from science and theory into practice and real life situations. A key pillar of his program is built on the idea of Nutritional Periodization and within-day energy balance. Here, Tom goes into specific details on how to accomplish these goals to achieve fat loss and muscle gain. Alongside these nutritional periodization and energy balance strategies, Tom goes into critical detail about pre- and post-workout nutrition - the most important nutritional strategies that will help you create an anabolic environment in your body to produce muscle gains and enhance recovery. While pre- and post-workout nutrition is critical, the daily nutrition and energy balance is just as important. Here, Tom goes into great detail explaining the ideas of carb tapering, carb targeting, and additional cyclical dieting variations. Obviously the strategies and methods contained in his program are far too extensive to be all listed here, but I hope that I've given you a good idea of what you can expect to learn. In part three of the program, Tom goes in great detail on training, and on training methods that will produce the best, optimal results. Another key aspect discussed here is cardio training. Tom clearly explains how much cardio is enough, how much is too much, and how much is too little. He then makes his recommendations on cardio training methods and strategies to achieve the greatest results. Tom's Holy Grail Total Body Transformation program is a complete, and effective system to help you achieve fat loss and muscle gain at the same time. There's simply too much in the book for me to go through it all; however, I hope that I've covered the most important aspects of it, and gave you a good enough review of what you can expect here. But to truly grasp the concepts, methods, and strategies in his program you'll have to test it out yourself. More importantly, even if you do purchase his total body transformation system, you will ACOMPLISH NOTHING if you do not have the discipline, the motivation, and the determination to commit to yourself - to commit to having better health, to follow a healthier lifestyle, and to building a better body.